This is the first post in a new series for me. Columbus, Ohio may be behind (way behind) cities like New York, Portland, or Seattle in the modern bar progression, but we do have a few sparks of light in this vast wasteland of college and alumni bars. I’ve detailed Details to death here already, but as big a fan of that watering hole as I am, the real driver toward a better class of cocktail in Central Ohio is the medium-sized chain of fine restaurants run by Cameron Mitchell. Not so very, very long ago, Cameron got bar religion. The first places in town (and still almost the only places in town) where I actually saw lime and lemons juiced right in front of me were Cameron’s restaurants, or restaurants where he consults. To my regular readership in the cocktailian world, freshly squeezed citrus is so basic as to be akin to Thou Shalt Not Kill . But to the average Central Ohio bartender or patron, explaining the value of fresh lime juice is like explaining the virtues of microwave ovens to an ancient Incan. Now, none of Cameron’s establishments are going to threaten Vessel, or Pegu Club, or the Velvet Tango Room for cocktailian supremacy any time soon, but they are the best I have to choose from around here, especially if I want a full (and damn good) meal to follow my drink. Therefore, I will be embarking on a series of profiles of the Mitchell’s restaurants, and more to the point their bars, in the coming weeks. It’s hard work, eating in the best restaurants in town and downing good drinks, but I’m willing to do it, for you. I’m going to try to feature a specific drink and/or bartender at each location, as well. The bar at M is the central feature of the restaurant, dominating the length of the restaurant with a huge, shifting color, backlit wall. They offer an extensive, well-balanced, and not terribly discounted wine list, as well as a reasonable beer selection, if you must. The cocktail menu actually has a number of original cocktails that are or look to be worth drinking, almost all featuring fresh squeezed or muddled ingredients. I have been eating and drinking at M regularly but infrequently since it opened (it’s a long way from my house). The bartenders have turned over in that time, but everyone behind the sleek plexiglass counter are consistently intelligent, educated, mixologists. Moreover, at M, unlike some of Cameron’s more frantic locations, they usually have time to for a little conversation about booze. This is a major plus for me, of course. The minuses for the bar at M are the same as those I’ve found at most Mitchell’s joints. Aside from the emphasis on fresh fruits, the ingredients on offer are fairly pedestrian. There are no exotic gins, beyond Hendrick’s, on offer. No absinthe, or Lillet, or orgeat, or falernum peeked their necks out to entice me into a Vesper, Corpse Reviver, or Mai Tai. M’s inventory covers all the basics, and covers them very well. But for the adventurous cocktailian, there is still room for improvement. Of course, they may have a secret stash of Old Raj, Fernet Branca, and homemade cinnamon syrup that I simply didn’t ask the right questions about, but I doubt it. This last Friday I was at loose ends. I had a babysitter, but I also had a wife in Georgia. Instead of choosing to go out and get into what little trouble Columbus has to offer, I opted for drinks and dinner at the bar at M to kick off this series of posts. My bartender this time was Cris, a mixologist by calling whom I had not encountered before. She and I, and the wine-drinking couple beside me whose date I kept interrupting, had a fine conversation about liquor, cocktails, wine snobbery, and of course the literary phenomenon that is sweeping the nation: The Pegu Blog. The evening was marred only briefly when Cris revealed to me that she will be attending Tales, the lucky wench. My fellow cocktail bloggers know how much I cheerfully despise them for being able to go when I cannot find the time, so it’s only fair I hate Cris too. I did tell her who I expected her to go pester while there. Consider yourselves forewarned, dudes and dudettes. Oh, and I’ll be interested to see which exotic ingredients that I griped about being missing above show up at M once Cris gets back from Tales. I immediately saw how I wanted to tinker with it, resulting in a cocktail that may appeal more to both me and my regular readership, if not necessarily to M’s usual clientele. Said tinkering has been accomplished, and it gave me the results I wanted. If you live in Columbus, I suggest you hightail it down to M and try the original, as well as mixing up mine. Let me know which you prefer. Dry shake the ingredients well, then serve over the rocks. Garnish with a slice of blood orange. A couple of notes here: I don’t like salted rims that much, as I feel like I either get too little or too much salt with each sip. The salt isn’t really necessary in this Margarita at all, but if you do want some, try mixing it in the drink for a change of pace. Also, I find it a particularly good application for the Tequila Ocho Plata I specified. I intend to do a full review later on this bottle, but I’ll take the opportunity to talk a bit about it here and now. (It was not what M uses, for what it is worth. Tequila Ocho is not for sale in Ohio, more’s the pity.) 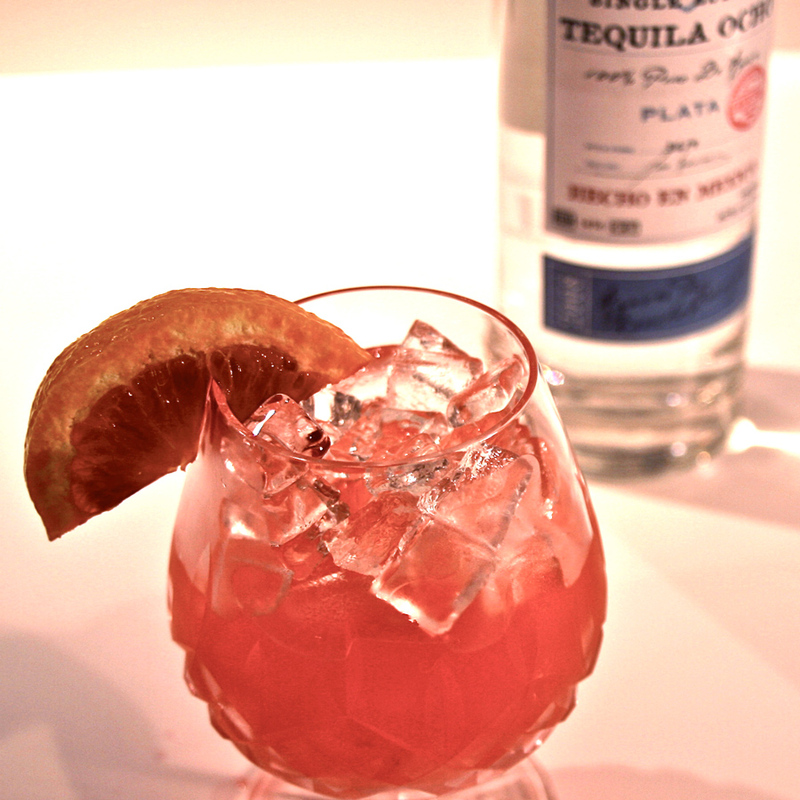 The Ocho is very mild, even sweet, and pairs very well with the exotic nectar of the blood orange. In fact, I think this tequila might get a bit lost in a regular Margarita, it is so mild. As a shot, it is lethally soft. It’s not unflavorfully smooth, mind you, but it is awfully easy to down, especially for an unaged bottle. Beware. Frankly, for a tequila aficionado, which I am not, I suspect the Plata would be a little bland. For a guy like me who likes to tinker, and also likes the occasional brush with the signature funk of agave, it’s a damn fine bottle to play with. It’s perfect for the drink I just outlined, and I intend to try it very soon with the Mai Tai variant, the Pinky Gonzales, where I think it will shine. Doug, thank you for the kudos !! I am sorry that you will not be attending Tales, as I can see it is very important to you !!! Please accept my invite to come back to M and enjoy our new cocktail menu which will be in place in 2 weeks. Well then I’m going to want a Corpse Reviver #2 when I come back…. Wait, how about Lillet Blanc?